Welcome everybody to Wednesday's Adorned From Above Link Party 24, and I am also giving you a great recipe for Rigatoni Carbonara. 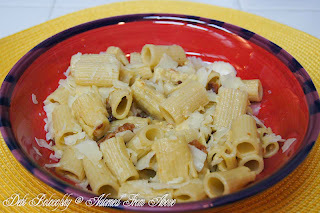 I will post the recipe for the Rigatoni Carbonara after all of the information for today's Party. I just want to remind everybody, that I am away on vacation so I will post the featured bloggers for the last two weeks along with the featured bloggers for this week on Wednesday, November 7th. I really appreciate all of you sharing your wonderful posts and links while I am away. I haven't had a chance to look at everyone's links yet, because the internet is very expensive on the cruise ship. I am grateful that I am able to write my posts offline, and then just go on quickly to publish them. I am very excited because on Monday I got to participate in an Iron Chef on Celebrity's Cruise's Silhouette with one of my table mates, Bridgette Khoury, from Montreal. We were the sous chef's for one of the chef's on the ship. It was a blast. We had to create a meal in 15 minutes with one minute to pick the ingredients. The chef made lamb chop, which looked outrageous. I have no idea how they tasted, because the judges were the only ones who tasted the food. We did not win, but it was exciting to participate, and we did win a bottle of champagne. Anyway, we were in Malta yesterday, and today we are in Naples. I love Italian food. Which is fitting since today I have put Rigatoni Carbonara on the menu. Now on to the party. Welcome, again, to my Wednesdays Adorned from Above Link Party 24. I hope that all of you have fun, and I can't wait to see all of your beautiful work from last week. You are all truly amazing. I want to thank all of you for your support of Adorned From Above. I really appreciate all of the time you take to link to my parties. Keep up the good work. Bring 2 quarts of water to a boil. Add salt and olive oil. While the pasta is cooking beat 3 eggs well in a bowl, add the pepper. Once is it mixed well and the rigatoni is cooked add the egg mixture to the pasta and stir well. The hot pasta cooks the eggs, so you do not have to worry that you are eating raw eggs. Next, add the bacon, and mix well again. You can now add the parmesan. I always put it on top of the rigatoni, because my husband is allergic to cheese, so I top our our Rigatoni Carbonara with parmesan at the end, but most people add it in before serving. It helps make a very nice sauce with the egg and bacon. This can be made as a meal in its own right, or you can use it as a first course for beef, chicken, or fish. Thank you so much for coming by today. I hope you like the recipe and the party. I always love hearing from you, so send me your comments. Have a great week and ENJOY!!!! Thanks for another great party Debi!!! Keep having a wonderful time Debi! Thanks for hosting! Hope you week is going great! Debi, I was having problems linking up this morning and now my Cake Mix Sprinkle Cookies appear 3 times! Can you delete the extras for me? Thanks for hosting! Thanks so much for hosting!! The recipe sounds so yummy! I am definitely a pasta gal!! Debi, I LOVE easy meals, esp ONE DISH meals such as this, well not counting the ever important side salad ;-) Sounds delish! Thanks so much for hosting, Debi! Hope you have a fabulous weekend!